Don’t forget to check and see if your state allows self distribution, and definitely check out our advice on distribution contracts. Lots of stuff to consider/watch for. At the awards ceremony during the Great American Beer Festival, Charlie Papazian, president of the Brewers Association, asked how many in the room got their start homebrewing. Nearly every hand in the 5,000-plus auditorium went up. The scene always drives the point home that these craft beer businesses start as passions, which is really cool. The scene also stands out as a reminder that step one of starting a brewery — brewing beer — is the easy part for many in the industry. Step two, however — getting people to drink that beer — isn’t as easy. Our guess is there weren’t many in that auditorium who also started out as homedistributors or homemarketers. There’s no kit you can buy to help sustain an effect sales strategy. This is why we reached out to a handful of finalists from this year’s Craft Beer Distributor of the Year Award, which was also handed out in that packed GABF auditorium, for their advice on keys to craft beer distribution success. Craft breweries see varying degrees of success and frustration with the three-tier distribution model across the country, but in nearly every state, all trends (and regulations) are starting to move in craft beer’s direction. These distributors, in particular, are in the middle of successfully pushing portfolios of craft beer to market. One quick takeaway we wanted to note is each distributor reported more sales coming from their off-premise channels, but they all believe that on-premise is the most important channel for growing and developing craft brands. So don’t let the numbers fool you. Jay Martin, President/GM, JJ Taylor Distributing Florida Inc.
JJ Taylor took home first place in this year’s Craft Beer Distributor of the Year race. Currently distributing in 17 counties on Florida’s west coast, JJ Taylor represents 41 craft breweries, including New Belgium, Cigar City Brewing, Dogfish Head, Bell’s, Florida Beer, Gambrinus, Lagunitas, Brooklyn, Stone, Harpoon, Abita, Anchor, Summit and Oskar Blues. The company’s mix between on- and off-premise is about 50/50, but on-premise only represents about 24 percent of its volume. Mike Gretz Sr., president, Gretz Beer Co.
Gretz Beer Co. serves 1,700 accounts throughout suburban Philadelphia counties of Bucks, Montgomery, Berks, and Delaware counties. Gretz has 172 off-premise retail accounts that make up roughly 55% of its sales, with the other 45 percent going to the 1,500+ restaurants, bars, and other on-premise. Gretz has 25 craft breweries in its portfolio, including Victory, Troeg’s, Anchor and Long-trail. Windy City covers the eight-county Chicagoland area, with around 2,400 on-premise accounts and 1,400 off-premise. The off-premise makes up about 65 percent of the company’s overall volume. From a strictly American craft beer perspective, Windy City has 35 suppliers, with the tops by volume being Lagunitas, Two Brothers, 3 Floyds, Allagash, Stone Brewing, Left Hand, Oskar Blues, Metropolitan, Surly, Victory, and Ska, with dozens of other local and specialized breweries such as Solemn Oath, Off Color, Dark Horse, Green Flash, Great Divide, Avery, Perennial, The Bruery, Lost Abbey, Brewery Vivant, and Maine Beer Company. The Ace Distributing distribution footprint spans six counties in south central Pennsylvania, servicing direct to over 850 retail partners, both on- and off-premise. The majority of its accounts are off-premise. Ace services on-premise taverns, restaurants, bottle shops and grocery stores, with the majority of the volume coming from independent off-premise beer distributors, where beer is sold by the case. Ace represents over 31 domestic craft breweries and two international specialty breweries. Chip Mims, CEO, Mims Distributing Co.
Mims Distributing’s beer distribution footprint encompasses North Carolina’s greater Triangle area and includes the following counties: Chatham, Durham, Franklin, Granville, Orange, Person, Vance, Wake and Warren. The company recently reentered the wine distribution business, and have expanded its operations statewide. Mims’ account mix is split 50-50 between on- and off-premise accounts. There are about 3,000 licensed retailers in its territory. The distributor’s craft portfolio consists of 13 craft breweries, including Boston Beer, Sierra Nevada, AleSmith, Anchor Brewing, Lagunitas, Foothill, Ballast Point and Carolina Brewing Co., among others. Craft Brewing Business: Describe craft beer’s role in your markets? Is craft beer a staple? A growing commodity? Mims: North Carolina’s Triangle region is home to some of the most educated hopheads in the country. The craft beer industry is booming in this area, which boasts more than 30 local breweries. Because Triangle drinkers know and love their craft beer, the demand for outstanding brews and for Mims Distributing Co.’s services has grown exponentially over the past decade. Depending on the source, craft beer accounts from 12 to 15 percent of our market. Martin: Florida, like the Southeast, is less developed in craft as a percent of total beer volume compared to most other regions in the nation, but the growth trends are leading most regions. Five years ago, Florida had less than 30 breweries, now there are over 100. The Tampa Bay area is recognized as the hub of craft beer in Florida, with craft beer growing across the state. Fochtman: At Ace, we are seeing the transition of corner bars and macro domestic accounts converting to craft and specialty beers, similar to what many metro markets have been experiencing over the years. Our market, while traditionally very macro-based and rural, has a rapid growing craft segment, currently trending at a 32 percent growth over the past three years. In our footprint, we began investing heavily in the education of our company, retail partners and direct to consumers, in the aspiration of expedited the growth of the market and an appreciation for great craft beers. This plan has been very successful, through our original programs such as Beer School, Brewers Table, Science of Beer, Think Drink and many other weekly events. Gretz: Craft sales are gaining every day, and craft beer is becoming a staple in most accounts. Draft is a huge part of the phenomenon, and Pennsylvania is a “case sale” state, so we tend to have a higher mix of craft on-premise. We are primarily a suburban geography, and the demographic is mostly ideal for the craft consumer. Collins/Phillips: In the city of Chicago, craft beer is becoming much more a staple, especially on the north side, and the majority of our business is, of course, in the city. At the high volume end of our portfolio, I’d say there are brands that retailers “want” at this point, but we would hesitate to use the word commodity. There are still stones to be unturned within our entire footprint. We recognize the suburban and south side of the Chicago footprint as an expanding frontier for craft beer, rife with opportunity. Our goal is to nurture the existing craft business, but more importantly to turn on new retailers to our portfolio every day. We want them to be a part of the craft community and support their efforts to make beer decisions based on quality. Our on-premise focus has set the standard over the years with our brands.Those industry professionals seek out quality with their food and beverage programs, and we try to maintain a strong partnership there. We prefer to align our expectations annually with our breweries and execute a full year strategy. We want to set realistic goals for each side: production from the brewery, sales through us. We work through our business development and sales management infrastructure to monitor progress and respond to opportunities. CBB: Talk about a brewery that you consider to be one of your best success stories. What happened? What was the strategy behind the success? Gretz: When we began to sell Victory Brewing almost 15 years ago. They were self-distributing and were selling almost 3,000 case in our footprint. This year we will expect to sell close to 200,000 CEs of Victory and are growing at over 30 percent YTD. We believe in the brands we are selling, we are in the business of building brands, and we love it when a company like Victory needs to build a new brewery to keep up with our sales. Collins/Phillips: The largest success story by volume for us is Lagunitas. We partnered with them in 2006. We built their brand together by driving home their vision of craft beer, and used Tony Magee’s relationship with the Chicagoland community to solidify that vision. When we launched Lagunitas in June of 2006, we had less than five on-premise retailers who had ever even heard of them. We have become their largest distributor in the country. Two Brothers, the founding family of Windy City, is a success story in a different way, but no less profound. Windy City was founded in the late ‘90s due to changing regulations in the three-tier system. No other wholesaler in Chicagoland would consider distributing their beers when they lost the ability to self-distribute. The creation of Windy City provided an outlet for a lot of great breweries, but Two Brothers has been growing double digits ever since and is the second largest volume brand in our book. Allagash is one of our oldest and most successful suppliers. We’ve been distributing their beer for about 12 years. Their success straddles the line between limited supply and successful growth. When they pulled their brand from nearly 30 distributors across the country a few years ago, we were one of the few lucky one’s outside the East Coast to remain. Ten years ago, we were selling only a small amount of beer, but there was a lot of passion for what Rob Tod was doing in Portland, Maine, with his brewery. They are a brand driven heavily by the on-premise channel. Almost 80 percent of their volume is on-premise. In Chicago, with their continued expansion and supply over the years, we hope to reach the 100,000 CE mark with them this year. More than 67 percent of that volume is White draft, which together we’ve developed into a first call brand in our market over the past 10 years. When you include package, White makes up 88 percent of their overall volume. That is a unique concept in the craft world, and one that we’re very proud to have cultivated in Chicago. There’s a lot these three breweries have in common as examples for success, but really, they couldn’t be any more different. Their vision, concept and company culture couldn’t be more varied, and their success has developed with entirely different market strategies in Chicago as well. Mims: AleSmith Brewing Co. in San Diego recently selected Mims Distributing to launch their brews in the Southeastern United States. We are putting together our third container of AleSmith in just 120 days of sales, which points to our ability to build brands in an extremely rotation-heavy market. One of AleSmith’s beers, Summer YuleSmith, was an immensely popular seasonal double IPA that Mims Distributing had great success in promoting. In order to fully integrate the offering into our distribution area, Mims Distributing staff met with chefs at a restaurant in Carrboro, N.C., to create a seasonal menu that would complement the robust citrus and earthy flavor of the craft beer. Our strategy for promoting AleSmith included educating our staff and retail partners as much as possible on the company’s wonderful craft beers so they could promote the product excellently to customers. We also made sure that we got out in the community where local beer lovers frequent in order to spread the word about AleSmith’s brews. One of the main takeaways from our efforts with AleSmith is the old adage that “knowledge is power.” When you know a brewery inside and out, and share that knowledge with others in the community, your distribution efforts are sure to be a success. Martin: We have several success stories, but Cigar City has to be at the top of the list. The principle that worked for them works for most if not all: great quality beer, great educated people, plan the work and work the plan. The plan has to deliberate and patient. You have to be careful not to get ahead of the consumer. CBB: On the flipside, what is an example of a distribution plan gone wrong, and what can we learn from it? Martin: I have seen brands that did not plan the work and work the plan. Part of the failure of not planning the work is having the appropriate plan — being deliberate and patient. Some brands do not travel well, either. Even when planning the work, and working the plan in a deliberate and patient way, they do not resonate with the consumer in a market that offers choice at an all-time high. Gretz: There a only a couple of brands that have had issues in our portfolio over the years. [They shall remain nameless.] The primary reason they did not succeed was quality and consistency of product. 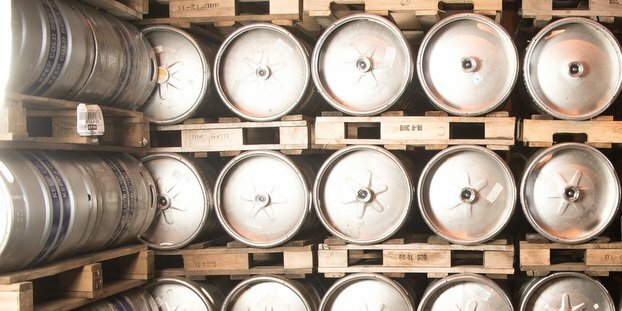 As more breweries get into the business, it will be increasingly important for the brewer’s product to be high quality, but it is also important to be able to have support in the market to supplement the investment that the wholesalers are making. Mims: We have been very fortunate that our launches over the past several years have been very successful. That’s a tribute to the great breweries we represent, their incredible beers, and the work we do together planning ahead of time. When we see mistakes made in our market, they seem to be either half-hearted efforts or a two-week blitz that is soon forgotten or replaced in a month with something else. CBB: What are some factors or criteria that are important for you when choosing which craft brewers to work with? The Ace Distributing Sales Department & Management team, including co-owner Tim Strickler. Fochtman: When we are researching and meeting with potential craft suppliers, the first criteria is the liquid. If the beer does not meet a standard of quality, then the rest is worthless. At Ace, we care deeply about the long-term plans of our brewery partners, we need to see a clear vision and daily plan to ensure a successful partnership, through both financial and human capital investments in their future. We look for partners for the future, not just suppliers that fill orders. Mims: We look for people who are deeply connected to the beers they brew. These craft brewers are passionate about their product and have a story to tell. They must be committed to brewing outstanding beers and fanatical about quality. Martin: What is their passion? Where is their brewery? Is the beer good? Is their packaging/theme/marketing relevant and different? What is their plan and expectations? Do they know the market and are they realistic in their expectations. What is their investment in the market? Are there feet on the street? Gretz: Quality of liquid. Passion for their business. Financial stability. Bricks preferred to contract. Ability to support the brand. Collins/Phillips: The quality of the beer is paramount. The pedigree of those involved in the brewery defines where they’ve been and what we can reasonably expect. The concept for their brand on its own is key, but also how it fits in our portfolio and in the Chicagoland market both matter a great deal as well. Finally, what support can we expect from the brewery to help build their brand? Support does not mean money, but time in the market and consistency of product. CBB: What are some business planning or marketing trends you are seeing out there among craft brewers? Collins/Phillips: We’re not fans of discounting or “incentive-driven sales.” We feel short-term focus within a portfolio reaches only short-term goals, which doesn’t drive the brand forward for the long term. If we focus on your brand this month, whom are we focusing on next month, and the month after? Are we unintentionally just asking the sales person to swap in the new brewery next month, and remove/replace all the placements they just achieved for the other brewery? We prefer to align our expectations annually with our breweries and execute a full year strategy. We want to set realistic goals for each side: Production from the brewery; and sales through us. We work through our business development and sales management infrastructure to monitor progress and respond to opportunities. The basic concept is to build the brand around a long-term concept that requires daily, weekly, monthly and quarterly execution with our entire portfolio. Fochtman: While there are some great marketing strategies that obviously work, there is nothing that brings greater joy to a retailer or consumer than the friendly face of a great brewery rep. At times, today, the industry tends to lose sight of the personal interactions and human capital that has helped to build the beer industry. We are one of the most social industries in the world, and the feet on the street and personal touch, when possible, is nearly always the most successful. Marketing trends and promotional pieces will come and go, but human trust and interaction is timeless. Martin: I used to think that it was about the best national, regional and local brands. Today it is about the best national and local brands. Today’s best locals are the regionals. Gretz: Innovation continues to drive the bus, while the “old staples” will continue to need support via sampling and marketing. Mims: Marketing trends that we are seeing quite often among our craft brewer partners include beer festivals and tap takeovers. Many of our craft brewer partners are active participants in North Carolina’s Craft Beer Month, which takes place in April, as well as several area craft beer festivals. This includes Raleigh’s World Beer Festival, where pint enthusiasts can sample from more than 250 local and international craft brews, as well as Brewgaloo, a festival that showcases some of North Carolina’s tastiest trippels, IPAs, porters, stouts and more. We partnered with Foothills Brewing Company and Carolina Brewing Company for Brewgaloo, hosting a popular beer dinner with the latter. Many brewers also regularly participate in craft beer tap takeovers at local bars and restaurants. Host locations put a brewer’s most popular beers on tap for a night, and customers get to taste great beer and learn all about a particular brand. These kind of events are incredibly successful, especially when distribution staff is on-site to answer customer questions and educate retailers’ staff members. CBB: What’s one thing a craft brewer could do today, right now, that would help his or her distribution plan? Mims: Craft brewers who can put their own people in markets tend to be more successful than those who don’t. Retailers enjoy seeing our team, and they love meeting the folks who work with those who create the beers they love to drink and to sell. Brewery reps can seek out local bars, restaurants and other retailers and work on forming relationships. Martin: Hire a good operations manager. They will pay their cost off several times over. Gretz: Consumer awareness is the key to success for craft brewers. Therefore, I would say sampling, sampling and more sampling. For the local brewers, they need to continually drive that message home, and offer as many brewery visits as is possible. Fochtman: Be willing to learn what it takes to get that beer from the brewery to the tap. The brewery partners that have open dialogue with our teams and grow to intimately understand all of the variables of distribution tend to have a greater understanding and appreciation for not only the wholesaler, but the retailers efforts in the end-sale to the consumer. CBB: What are the keys to your business? How should a craft brewer judge its own distribution relationships? Martin: The keys to JJ Taylor’s business are people, portfolio and planning. Craft brewers should be very careful in choosing distributors. Don’t get sucked into the “don’t go with that distributor because their portfolio is too big,” or “they have the big local business,” etc. Think about why that is. There is a reason they have a great portfolio and have the biggest/best brands. Gretz: Communication of expectations from both sides is key. If a brewer comes into the market without any idea of what they are expecting from a wholesaler as far as support of the brands, that is a bad sign. We are very clear about our plans and level of support from day one, and all of our sales and marketing personnel are accountable to those suppliers for execution of those plans. Collins/Phillips: Company culture is the absolute key to our business. From our culture comes everything we do, everyone we hire and everyone we have a desire to do business with. We understand that we’ve spent a long time fighting a very hard battle to put craft on a different level in Chicago, so our strategy has had to develop from that perspective. We believe that building brands requires a holistic approach and doesn’t benefit from short-term focus or brief spikes in distribution points or sales. The right beer, in the right accounts, in the right quantities all year long serves brands better than jamming beer down people’s throats, from a sales team perspective and a retailer perspective. The primary goal must always be to develop the sales team’s relationship with the brand. We should be the experts in our market. We should know and understand where our breweries fit and how they can best succeed. They should trust us to both promote and protect their brand, and honor the commitments we make to each other. We should be defined by how we care for our retailers and their needs. Fochtman: Partnerships. If a brewery is interviewing a wholesaler and quickly starts to realize that their wholesaler partner ends their day at 4 p.m., and is not willing to do anything to build their portfolio until 8 a.m., then that is a red flag. We require our craft team to execute a specified number of beer schools, tap takeovers, samplings, festivals and other events to get in front of the consumer directly and learn what they like and do not like. The education must begin and end with the consumer. With that said, it is both the brewery and the wholesalers responsibilities to build the brands, not one or the other. Properly promoting our craft brewer partners and their beers through ingraining the product in the local community through high-level service, event participation and more. CBB: Tell us a little bit more about your company. Any new announcements recently or in the works? Martin: J.J. Taylor Distributing Florida is one of two beer divisions (second beer division is J.J. Taylor Distributing Minnesota) of J.J. Taylor Companies with a shared services office in Jupiter, FL. JJ Taylor Florida has Sales Centers in Tampa, Fort Myers and Fort Pierce and a depot in Sebring, serving over 11,000 retail customers over 13,000 sq miles with a population of 5.4 million. We have the honor of representing 70 suppliers with over 850 brands and 1,600 active SKU’s at any point in time. Just as we did not just wake up and think we should embrace craft, we have been working hard on green initiatives and sustainability. Most recently, we have installed a CNG fueling station at our Tampa Sales Center and our Fort Myers Sales Center. We have converted about 40 percent of our tractors and 60 percent of our miles to CNG. We have a full time digital media coordinator and an intern in both Florida and our Minnesota beer division. At the time you are reading this, we will have launched our new website with a first of its kind beer finder (ability to search by SKU, not just brand, with full product information and share ability). We have been working with Factory Interactive and World Class Beer for nine months to build the site. Gretz: Gretz Beer is about to move to a 300,000-plus square foot warehouse and distribution center. It will be the most advanced technology available, and will be completely solar powered. Part of the new warehouse will be a highly advanced homebrew system that we will offer to homebrewers free of charge, with guest brewers attending to offer brewing tips. We recently re-structured our sales force to add more positions on our craft team, and special focus positions for the growing chain and supermarket channel. Collins/Phillips: We have grown a lot in the past 18-20 months, from every angle. Our front of the house has grown dramatically, and we’ve completely redeveloped our back of house to serve the needs of a rapidly growing business. Since January 2013, we went from 13 trucks and 12 drivers to 27 trucks and 29 drivers. We’re also adding an “A” class reefer semi trailer in Q1 of 2015, which we’ll put in to rotation for large pallet routes. We’ve also replaced nearly our entire fleet in that time frame, adding more reefer delivery to our routes with each expansion. We’ve continued to build our logistics and warehouse space, and expanded our cold storage from 6,000 square feet to almost 20,000 square feet. We added a Director of Operations, a Purchasing Manager position and an Inventory Manager position to make sure we maintain the freshest “days on hand” of inventory for all of our suppliers. We’ve gone from 12 sales people to 23 territory sales people, and added five chain sales people, and four merchandisers. Fochtman: Ace is a very progressive company, working diligently to be ahead of its competition and the forefront of the industry when it comes to market strategy. Even though we are located in rural Pennsylvania, we have been nominated two years in a row for our craft strategies by some of the largest craft breweries in the U.S., in addition to many of our retail partners locally. We believe that education and quality is the key to the success of the craft industry, at all levels of the three-tier system. Ace is also a very community-focused local business, supporting dozens of local non-profits and programs, as our mission is to build a strong community. Mims: As mentioned before, we are just beginning work with San Diego’s Ballast Point. The introduction of new brewer partners like them, AleSmith and Foothills, plus our growth, have allowed us to add people to our team over the past several years. Our salespeople and merchandisers are all Cicerone Certified Beer Servers. We have two Certified Cicerone managers focused on educating others about craft beer as well. Jennifer Balik, Brand Development Manager, is a leader in a male-dominated industry who is responsible for our growing portfolio of craft breweries. Tony Walldroff, Craft Brand Development Manager, handles 20-plus import, craft and local beers as the point person between the breweries and retailers. We also produce a weekly podcast, Tales from the Cask, which is hosted by Tony and Jennifer and CEO Chip Mims. The show provides beer news, interviews with people in the beer business, questions from listeners and lively discussions of the beers they sample. @BeerLawCenter @CraftBrewingBiz Thank you for the shout out! We love talking about the world of beer! David Guzman liked this on Facebook.